The Large 2 Piece Sink Set includes a dish drainer and drainboard which are held together with snap-lock tabs, yet detach easily for cleaning. The inclined drainboard allows excess water to flow easily into the sink. 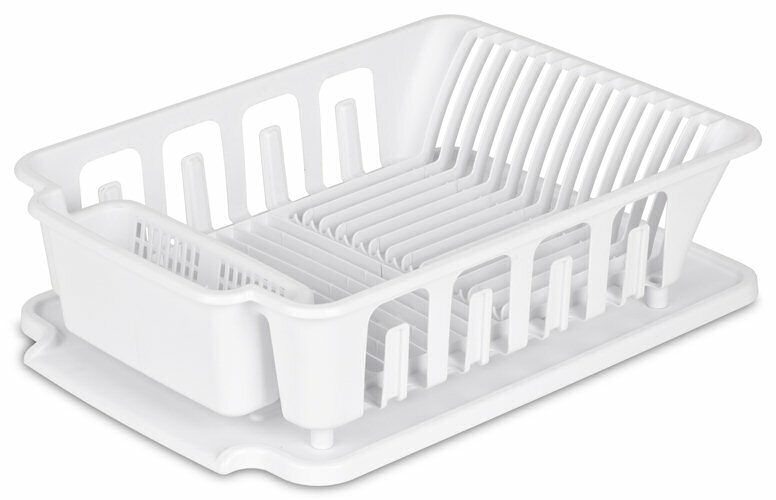 The dish drainer features a unique system of channeled grooves to accommodate 14 plates, 7 small plate/bowls and 8 cups, along with ample room for flatware. The large size and durable design is ideal for family use. 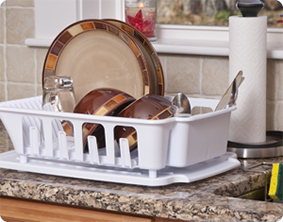 This sink set also includes a flatware holder with drain holes to prevent water from pooling. The overall dimensions of this item are 18 3/4" L x 13 3/4" W x 5 1/2" H.
Overall Assembled Size: 18 3/4" x 13 3/4" x 5 1/2"
The large size is ideal for family use. Large 2 Piece Sink Set is rated 3.5 out of 5 by 12. Rated 3 out of 5 by LoveRedinmyKitchen from Wanted Larger and in Classic RED. I had this one (in white) for about 14 years, been waiting for 2 years. I need a New one really want it in your Classic Red. Please the little one is way to small for a Family would be nice if it was Red and a bit bigger than you Large. The one I have is your large. Rated 1 out of 5 by Homemaker from Would be great if improved I've had this drainer for several months and I hate that the silverware holder is too short and the silverware cannot stand in it. Also the draining board underneath has no slant and holds water. I will be replacing it as soon as i can find one that won't pose the same issues. Rated 2 out of 5 by Pinkster from Could be improved This drain board needs some improving. The sides need to be higher. The sides of the silverware caddy definitely needs to be and there needs to be another divider so the cooking utensils don't lean over or fall out. The back legs need to be higher so the water drains instead of just sitting in the catch tray. Also, the dividers need to be sturdier and not bend when you but a cutting board or other prep or cooking item between them. 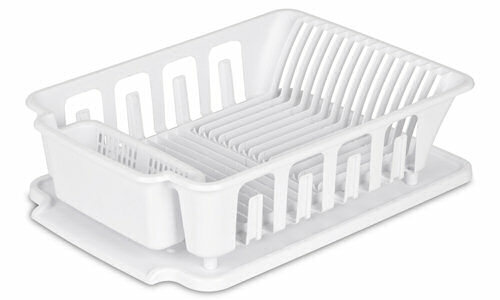 Rated 4 out of 5 by Crystal from The two piece sink set is well designed for all size kitchen dishes and glasses. The two piece sink set is well designed, easy to clean, and the white color fits in nicely in our kitchen. The design allows for multiple size dishes and glasses and any water drains nicely into our sink. Thank you. Rated 5 out of 5 by Polly from Better than it Looks When I first looked at this product, I thought it was flimsy and wouldn't hold much. This sink rack exceeded my expectations. Holds more than my old wire rack that it replaced. And, it's made in the US. Rated 2 out of 5 by rep5355 from Glasses drying, hanging off sides?? The first disappointment is that the glass holder portion is not over the drain board, so the water just drips on the counter. The glass holder themselves are very flexible and not tall enough to support an actual glass (See 2nd view - are they plastic cups?) The drain board itself does not slant enough and as already mentioned in another review, the utensil holder is not deep enough.